At famed waterway's bicentennial, it's not all water under the bridge. Whether you travel by bike, by boat, by train or car, or simply stop by for a short visit, there’s plenty to see, do, taste and hear along the Erie Canal this summer. Although 200 years have passed since Gov. DeWitt Clinton began building his “ditch,” the canalway remains a vital piece of upstate New York, as much for its history as for the impact it has on surrounding communities. With nearly 30 events planned up and down the canalway—in conjunction with the Erie Canalway National Heritage Corridor and the New York State Canal Corporation—there are plenty of opportunities to build your own road trip, or take the kids out for the day or your spouse out for a night. No matter which events you choose, you’ll gain a broader perspective on this piece of history you may have forgotten. “Starting in May and going right through the fall, these events offer great ways for people to explore and enjoy the canal,” said Bob Radliff, executive director of the Erie Canalway National Heritage Corridor. So head outdoors, embrace the region’s heritage, and have some fun along the canal. The Erie Canal Bicentennial celebration kicked off on May 11 in the village of Brockport with a three-day festival that included a reenactment of the canal’s ceremonial 1817 groundbreaking. On May 13 in Niskayuna’s Aqueduct Park, more than 600 people participated in the Pedal-Paddle-Run triathlon, completing a 7-mile bike ride, a 2-mile kayak or canoe trip and a 5K run. In Amsterdam, live music, water shows and a fishing contest are planned on June 9 for the at Amsterdam Riverlink Park, which connects to the new Mohawk Valley Gateway Overlook Pedestrian Bridge. Fireworks begin at dusk. As part of Water Music, the Albany Symphony will venture to several storied communities along the Erie Canal for multiple evening performances from July 2 to 8. Bonus: The concerts are free. 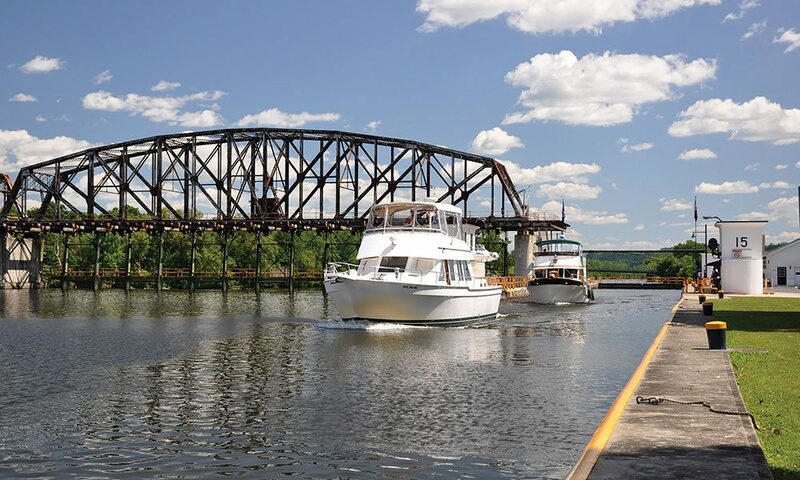 The Symphony will play on waterfronts in seven locations central to the canal’s history, journeying from Albany to Schenectady, Amsterdam, Little Falls, Baldwinsville, Brockport and Lockport. A community festival is planned July 8 and 9 at Fort Hunter, a state historic site in Schoharie, where guests can view all three eras of Erie Canal history. Demonstrations, wagon rides, magic, games and crafts—even a juried art show—are all lined up for Canal Days. History buffs can view aqueducts, locks, prisms, culverts, boat basins, even a slack water dam and canal store. An outdoor board game will give the kids a chance to play, while gaining insight on what life was like on the canal. If you love history, biking and adventure, you can Cycle the Erie Canal and pedal your way from Buffalo to Albany on the 19th annual bike tour. More than 500 riders will make the 400-mile long trek from July 9 to 16 as part of a formal ride organized by Parks & Trails New York. The route is mostly flat, and riders will cover about 50 miles a day, with a few rolling hills and some gradual climbs. Cyclists will learn about the role the canal played in New York for more than a century, and about the people who lived in communities nearby. Beginners and families are welcome, and two-day and four-day ride packages are available. If cycling isn’t for you, or you prefer four wheels to two, sideline cheering is encouraged. The cost for an eight-day adult rider is $840, and camping facilities with showers are included, as well as eight breakfasts and six dinners. Live music and history lessons are planned each evening. All your bags and equipment will be transported from point-to-point, so you can pack light for each ride. On July 15, Mabee Farm in Rotterdam Junction will host CanalFest, a family-focused day of activities ranging from crafts and games to live music—even cooking and blacksmithing demonstrations—in conjunction with Schenectady County and Parks and Trails New York. Some activities will harken back to the old days, and others will explore recreational activities available today. Mabee Farm is the oldest home in the Mohawk Valley; tours of the 17th-century historic site will be available. The 13th Annual Cardboard Boat Race at Fort Hardy Park in Schuylerville is a well-loved local tradition slated for Aug. 12. Everyone is invited to design, build and race a cardboard boat across the Hudson River, and you should plan on sticking around for live music, canal-focused educational programming, and local food. In Hudson Falls, interpretive walks, guest speakers and historical demonstrations for residents and visitors are the focal point of the Celebrate Our Canals event on Aug. 27. The Feeder Canal Alliance, which is celebrating its 30th anniversary as stewards of the Glens Falls Feeder Canal, and the Chapman Historical Museum will lead demonstrations on birding and the environment. The day will also include guided walks along the towpath, as well as visits to historic coal silos and a series of Five Combination Locks. The Tugboat Roundup rounds out the bicentennial series locally at Lock 2 in Waterford Harbor, Sept. 8 to 10. Visitors are “transported” back to a time when the Erie Canal was in its heyday. Several tugboats will be open for public tours and all events are free, except boat rides. Food and craft vendors will be on hand all three days, with live music and fireworks on Saturday, and a family-friendly 5K on Sunday morning. For the full list of Bicentennial events along the Erie Canal from May through September, head to eriecanalway.org/explore.